+ This past Sunday, Eisley brought home her first completed Sunday School project. She wanted to hang it on the wall right away, and there it has been displayed since then. It brought back so many fond memories of being a little girl and bringing home similar projects to my own parents—something that feels so surreal, now that I have a child old enough to create these things herself! So precious. + Last month I reached my highest Swagbucks earnings in quite some time—passing my goal of $25 and actually making it to $35 in gift cards earned. I've still stayed within my goal of 10-20 minutes each day (view my how-to guide from last month here, in case you missed it!) and I hope to hit $40 this month. Referrals have given me an extra boost, but I have also still been having great success with surveys and reaching my daily goal. Every bit counts around here, and I'm happy to build up our Amazon gift card balance for gifts, beauty products (sometimes I can find things for crazy-cheap) and unexpected purchases that need to be made throughout the year. Even though it's not much, I love the feeling of adding what I can to our resources. + As I get closer and closer to my due date, I have freezer cooking on the brain. I love that there seems to be an endless amount of recipes out there on the ol' internet these days, and I'm eager to give some a try! We don't have a huge freezer (and we may actually be moving before the baby arrives, given we actually find a new place) but I'd like to start small with a few of the following options: freezer-friendly bean and cheese burritos, spinach lasagna rolls and freezer-friendly baked oatmeal. Do you have any favorites you've tried and recommend for a freezer cooking newbie? + If you're a blogger interested in becoming an affiliate for Warby Parker, now is a good time! I adore the glasses I purchased from them (and would love another—perhaps more quirky?—pair sometime down the road) and truly have nothing but good things to say about this company. If it's a brand you've had a positive experience with in the past, or you feel it would be a benefit to promote them to your readership, get all the details and fill out an application right over here. If you have any good things to share, please do so within the comments and share the love! Affiliate links included in this post; view my disclosure policy here. hurray for Eisley's Sunday School project, so so cute! And nice job on the swagbucks, it seriously is the best. Little Bonne Maman jam jars are a staple of Bed & Breakfasts in the UK. If you have Costco, you might fird you can by a box of them. 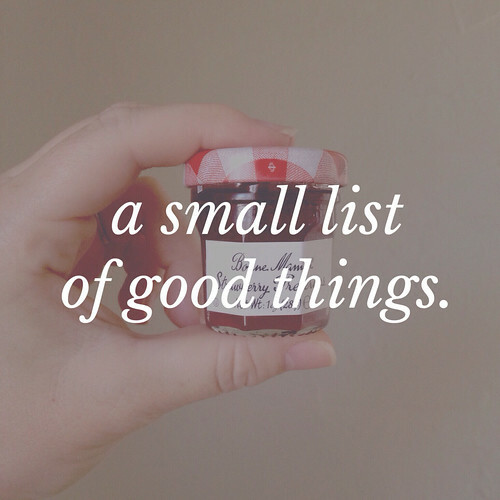 In addition to coming in adorable jars, that jam IS SO DELICIOUS!